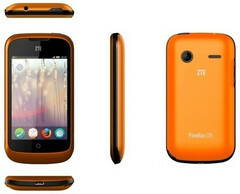 An amazingly cheap 3G smartphone powered by Mozilla's new Firefox operating system, the ZTE Open has been taking the budget smartphone by surprise, now arriving on eBay as well. ZTE Open is a budget smartphone that runs Mozilla's Firefox OS and it has been already released in Colombia, Spain and Venezuela. Unfortunately, it is not available in the US or the UK yet, but this is going to change really soon, making the ZTE Open the first Firefox OS-driven device to enter the US market. Additional features include GPS (with A-GPS), accelerometer and ambient light sensor. This budget smartphone will be priced at only $79.99, unlocked and off contract. Orders via ZTE's eBay page should go live this Friday, so keep an eye on it - this product will only be sold online in the US and the UK. If you're looking for a backup phone for you or even a cheap yet attractive handset for your child, then ZTE Open is a great choice.